There seems to be little difference to most people between learning and study habits. Study habits are really the organization that is used to exercise our learning skills. The habits of study have a great deal to do with learning. 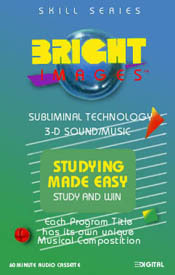 If you have found studying to be more that fun, you will find this program to be of great benefit. Improve your study habits and see how much more you'll enjoy learning. This program is a powerful tool that develops good attitudes and study habits. Setting aside time to study, provides confidence in your ability to study and makes learning enjoyable. It will let your mind work faster and easier so that information studied will be easier to recall. This Item is no longer available, Out of Stock.